And Yes That Means Catching Minnesota Walleyes in July and August!! Your Reunions and Large Groups (up to 60 anglers) are always welcome! Additional fishing time can be added to each trip. Rates subject to change. Save money with a reunion package! Please respect my hard work, no G.P.S. units allowed. "Josh, Many thanks for the enjoyable fishing you provided our family on Ottertail Lake the end of August. My folks were very happy with their 50 year family gathering. 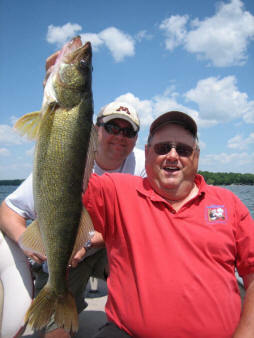 Join now and enjoy guided trips all year--open water and ice fishing! Memberships start at $1,200. Save up to 20%! Call Capt. Josh for more details, 320-291-0708. Shore lunches are also an available option with the full day trip. The shore lunch includes a Noon pit stop on the beach to clean and cook the mornings catch. The shore lunch typically includes fresh fish, Captain Kens baked beans, buttered bread, Lakemaid beer, and a GORP energy bar...if there's room! With advance notice, additional menu items such as rice pilaf, baked/mashed potatoes, or steamed veggies can be added to the menu. The meal is prepared by the executive chef (me) as you relax and reflect on the mornings catch. 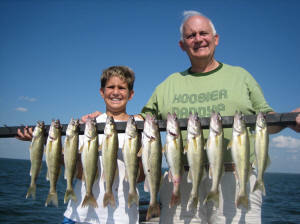 Includes: full day use of a deluxe heated fish house, holes drilled/cleaned and live bait. Tackle is available if needed. See Ice Fishing Rental page for more info. Includes: full day use of a deluxe 8x14 heated fish house, "on ice fish fry", my personal guide services, bait, and tackle (if needed). See "services page" for more info. Please respect my hard work in finding productive fishing areas for your enjoyment--I do not allow G.P.S. units in the fish houses or on the guided trips. Visa and Mastercard are accepted.